Agricultural producers used approximately 1.7 billion cubic metres of water to irrigate their crops in 2014, the same amount reported in 2012. Total volumes used for irrigation during the growing season were down in every province except Saskatchewan, British Columbia and Alberta. British Columbia experienced very dry conditions in 2014 and farms in this province reported 18% more water volume compared with 2012. Water irrigation totalled 277 million cubic metres in British Columbia in 2014, accounting for 16% of all irrigation water applied in the country. Alberta's irrigation water volume (1.3 billion cubic metres) was relatively unchanged from 2012 to 2014, accounting for three-quarters of the irrigation water applied to crops. 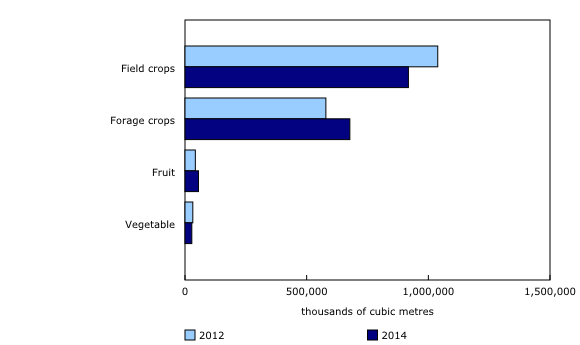 Field crops (55%) and forage crops (40%) used the most irrigation water across the country, with fruit crops (3%) and vegetable crops (2%) accounting for the rest. Most farms (5,585 farms) reported no issues preventing irrigation in 2014, but some producers did stop or forego irrigation, citing a shortage of water (395 farms) and poor water quality (470 farms). In 2014, 830 farms did not irrigate because of other issues, such as having received enough rain and/or flooding. Field and forage crops showed the highest irrigation intensities for the growing season, peaking in July with 1 250 cubic metres of water per hectare for field crops and 1 050 cubic metres of water per hectare for forage. Nationally, just under 586 000 hectares of land were irrigated in 2014, edging down 1% from 2012. Provincially, farmland in Alberta received the most irrigation (434 470 hectares), accounting for almost three-quarters of total irrigated land in Canada. Farmers reported that their irrigated area comprised mostly field crops (350 340 hectares) and forage crops (200 670 hectares). Fruit crops (18 810 hectares) and vegetable crops (16 050 hectares) were also irrigated. The most frequently reported source of water for irrigating crops was off-farm, accounting for 71% of the irrigation water. Farmers reported on-farm surface water (21%) as the second largest source, while 7% came from on-farm groundwater. As in 2012, off-farm water was the predominant water source for most western provinces (Alberta, Saskatchewan, and British Columbia), while most irrigation water in Eastern Canada came from on-farm, surface water sources. Provincial sources provided a large portion of the off-farm irrigation water in Canada, led by Saskatchewan (95%), Alberta (93%) and British Columbia (60%). Provincial sources consist of irrigation districts and projects or authorities. Some farmers reported that these were the only option available to them for irrigation water. The Agricultural Water Survey gathered information on irrigation water use, irrigation methods and practices and sources and quality of water used for agricultural purposes on Canadian farms during the 2014 growing season (April 1 to October 31, 2014). This survey is part of the Canadian Environmental Sustainability Indicators program. The volume of water is reported in cubic metres. One cubic metre equals one thousand litres. The area of land that received irrigation refers to land area that actually received irrigation. Land area that had the capacity to be irrigated but did not receive irrigation is not included. The 2014 survey estimates for both irrigation volume and area of land that received irrigation showed rates that varied widely across regions. Differences in weather patterns, crop types and farming practices can all lead to these variations.